This piece of equipment is very versatile and can be used anywhere indoors and outdoors. 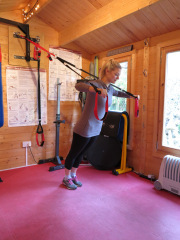 It provides a full body workout, incorporating the core, it increases whole body strength whilst burning those calories fast. In this video you can see how you can use this equipment to do a chest press and squats.